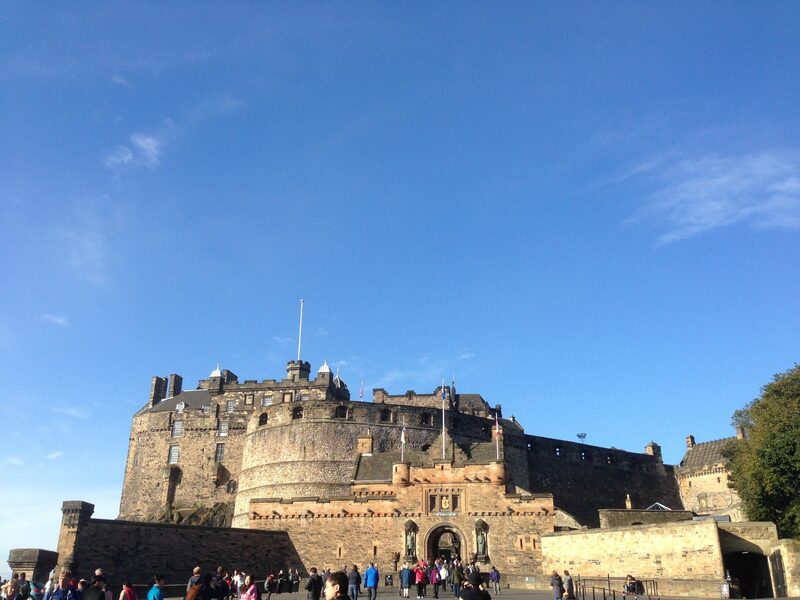 Standing perched atop a hill, Edinburgh Castle is the undisputed icon of Scottish history. Familiar to millions every year for its role in the Royal Military Parade and the Hogmany celebrations, no trip to Edinburgh is ever complete without a visit. With worldwide recognition come the inevitable crowds. But how best to make the most of your visit? And maybe leave you wanting to come back again for more? As the great city of Edinburgh is also one of the most walkable in the world, finding this great landmark couldn’t be easier. Highly noticeable from any distance, follow all routes to the Royal Mile. This can easily be reached from any direction. If from near the Palace of Holyrood and Arthur’s Seat, just keep walking straight on. But more simply head on to the bustling Princes Street and then walk up The Mound past the National Gallery of Scotland. Visible from anywhere in the centre, you cannot miss it! Follow the crowds to the castle! If you are anything like me then you would want to make the most of your visiting time. The castle is open to visitors from 9.30-5pm daily (last admission 4pm) but I would strongly advise an early morning arrival. Bear in mind too that Scotland (and indeed most of the rest of the UK) has some of the most unpredictable weather. Subsequently, this can play a part in your enjoyment of the castle experience! Most of my four day stay in Edinburgh was partly marred by a couple of days horrid heavy winds. As the forecast was for a dry and pleasant Saturday I made sure that day was set aside for visiting the castle. And a very wise idea as I had more than a good half day to explore this great fortress. Entrance is ticketed (£17 at the time of writing), so it would be advisable to make as much time for the castle as possible. As a word of advice I would not recommend trying to visit mid-late afternoon. Yes, last admission is at 4pm but honestly that will give you a very limited and hurried experience and quite honestly feel like a wasted opportunity. Edinburgh Castle has seen more than its fair share of military upheavals from the Middle Ages to its later status as a garrison fortress that housed many prisoners of war. After purchasing your ticket(s) and entering through the portcullis, one of the first buildings you see is the National War Museum of Scotland. Various uniforms, medals and vintage recruitment posters are on display here. This is where you will see a detailed history of the role that the Scots Guards and associated regiments played in various conflicts down the years. 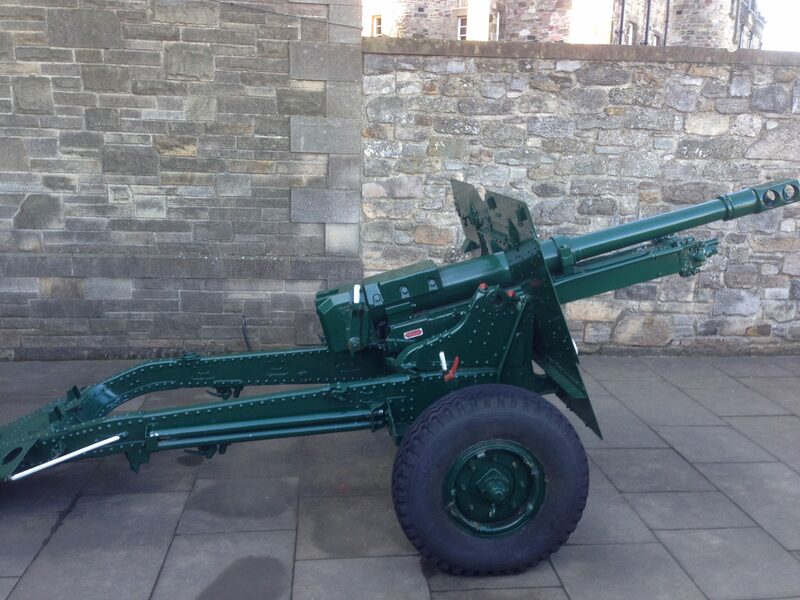 Around the east side of the castle is the location of the iconic One o Clock Gun. As its name suggests, it is blasted every day at 1pm. Around here and the Argyle Battery you can get some of the best views of the city. These stretch all the way beyond Calton Hill and with clear view of the Forth. The One o Clock Gun of Edinburgh Castle. Tourists eagerly watch at 1pm every day to hear the shot fired. The Palace Yard is without doubt the centrepiece of a visit to Edinburgh Castle. Better known as Crown Square, a name so given due to the location of Scotland’s Crown Jewels. The central courtyard is the location of the iconic Great Hall associated with the grandiose of James IV’s reign. The Great Hall, decorated with swords and armoury gives an authentic feeling of stepping back in time to the Middle Ages. 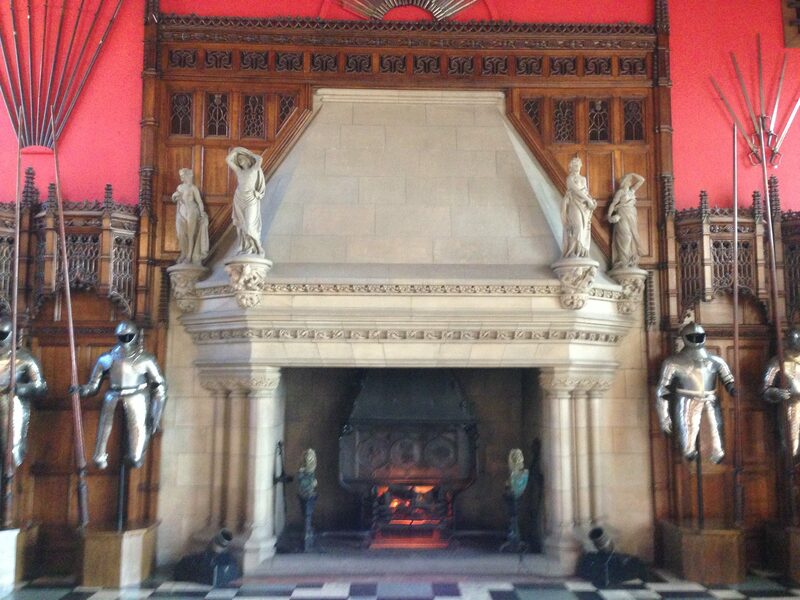 Swords, armour and a fireplace. And made for appropriate use on the BBC’s Hogmanay Live. The Royal Palace is the location of some of the most iconic features of Scottish royal history – the Crown Jewels and the Stone of Destiny. The jewels that were used at all coronations until 1704 are more than a national treasure so photography is not allowed. But why not make the most of it by re-entering the room again? And again. And again. Nearby in the palace, is the Stone of Scone (or Stone of Destiny). The sandstone block which crowned many a Scottish and British monarch has had an eventful history. Forcibly moved to Westminster Abbey by Edward I in 1296, it stayed there for 700 years. After failed attempts to return the stone to Scotland in the past it was finally moved back to its original home in 1996. Here, it will only ever leave the castle for future coronations. 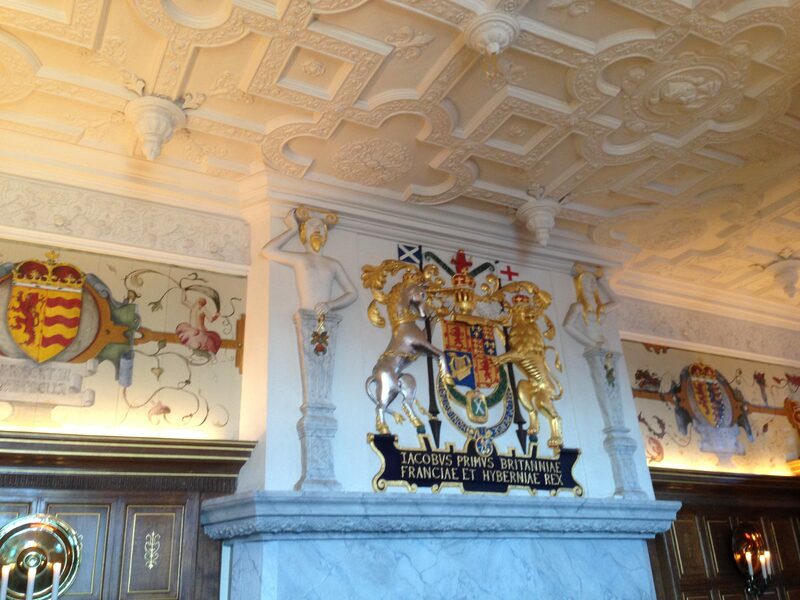 On the ground floor is the Laich Hall, with the elaborate royal coat of arms proudly adorning the fireplace. Further along, is the James VI Birth Chamber. This is the room where Mary gave birth to the future king, lovingly restored to look as though nothing has changed since the 16th Century. Towering high and mighty is the Scottish National War Memorial. Opened in 1927 to pay respects to those in the Royal Scots Guard who lost their lives during The Great War, it is a place for a moment of reflection. Pillars and plaques stand tall and beautifully designed stained glass windows provide the only source of light into a suitably sombre memorial. Going back outside walking along the Half Moon Battery, where various cannons stick their noses through the terrace walls, was a perfect opportunity to get another great view of Edinburgh. Next came two of the castle’s most cherished sights. Going inside St. Margaret’s Chapel. The oldest surviving building on Castle Hill and also the smallest and narrowest! St. Margaret’s Chapel, the oldest and perhaps smallest building intact here, is a stone chapel dating back to the 11th Century AD. Very much neglected in later years, but restored to use in the 1920s complete with newly installed stained glass windows. 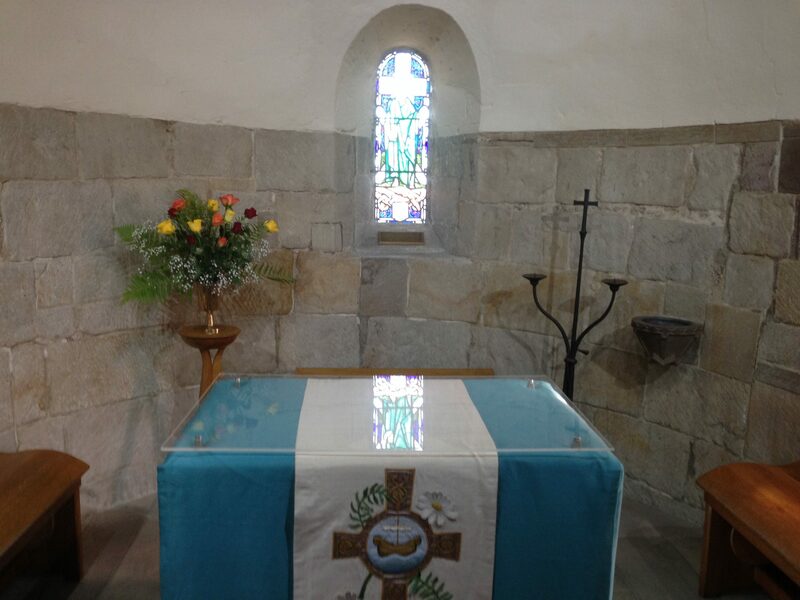 Today, the chapel is well looked after by Historic Scotland who go the extra mile to put fresh flowers on display at the altar on a regular basis. It is even used for weddings and christenings too. Standing outside is one great cannon no longer in use but one of the largest of its kind. 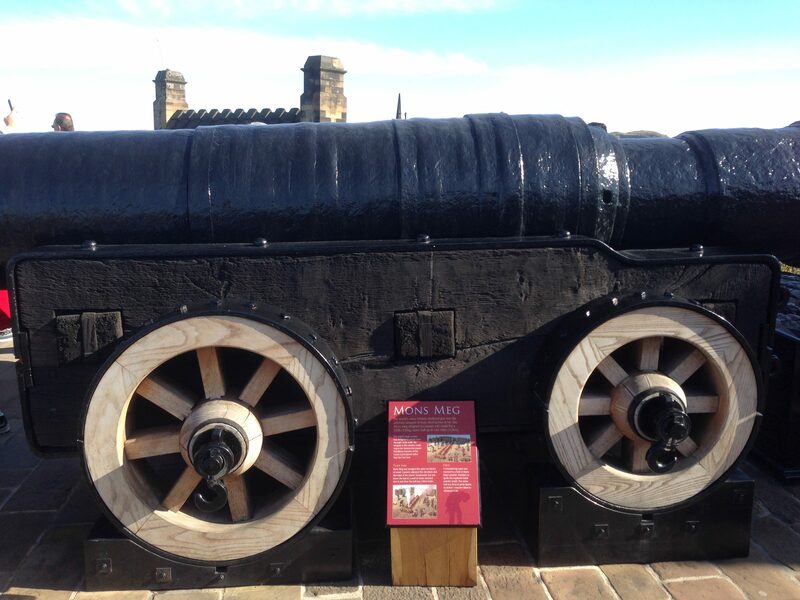 Mons Meg, was a powerful beast back in the day, capable of blasting a 180kg ball long distances. Installed by James II in 1454 and put to sufficient use till semi-retirment in 1540. Still firing shots for the welcoming of royal visits afterwards, the barrel burst in 1680. Soon after it found a new home in the Tower of London for safekeeping. That is, until the influential Sir Walter Scott successfully campaigned to have the cannon returned in the mid 19th Century. As the plaque reminds you – do not climb on Mons Meg. Please treat this grand old lady with some respect. Moving on past the outskirts of Crown Square, an ideal way to draw the visit to a close is to visit the Prisons of War exhibition. Dark and dingy with only the smallest sliver of light coming through, this is where in the 18th and 19th Centuries, enemies of the crown were kept. The communal prison rooms remain in an authentic look, with (cardboard) food on the table and replicas of prisoners uniforms hung up. There is a bit more light but no less sanitation in the other more Alcatraz-like prison nearby. And that, I think is a suitable way to conclude your day at Edinburgh Castle. If you like, why not make the most of your entrance fee and do the whole thing again? A nice restaurant/cafe is on site (next to the Argyle Battery), and get cosy inside as you can eat whilst looking over the Georgian style New Town below. I think that sounds like a great way to make the most of such a famous attraction, don’t you?